I have to admit. I was daunted by a chicken. I don’t normally cook whole chicken, as everyone in my family fights for the dark meat, and it’s typically just simpler and cheaper to buy thighs or drumsticks. Plus, after reading Matt’s post on the huge rates of campylobacter or salmonella especially in organic chickens, it seemed that any dealings with chicken were like betting the rent money on a hand of blackjack. I really don’t like chickens when they are running around and pecking things… now, dead seems to instill about the same amount of fear in me. Cook too little for fear of some Pythonesque Salmon Mousse incident… and cook too much and end up with chicken the texture of beef jerky. But when I saw the honey-roasted spatchcocks in the Spring 07 Donna Hay, all glossy and moist, I was tempted. The idea of a honey roasted chicken just sounded too good to pass up, and I got concocting melding the marinade from that recipe with a basic roast chicken preparation. Between a watchful eye and the super moist marinade of tupelo honey, olive oil, lemon and a few seasonings, I ended up with quite the succulent roasted bird, if not exactly my most photo worthy (my chicken skin had a bit nasty split across the top). The tupelo honey gave a great slightly sweet tang… present, but subtle. I’d recommend sticking with a buttery or citrusy flavored honey for this recipe rather than a floral scent. 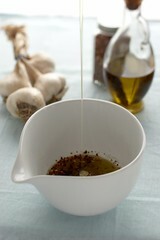 Combine the honey, olive oil, garlic, chili flakes, sea salt and cracked pepper in a bowl and whisk together to combine. Set aside. Rinse the chicken under cold water and pat dry. Place the chicken in a large plastic bag, and pour the honey marinade into the bag, and massage the chicken lightly to work the marinade all over the chicken through the bag. 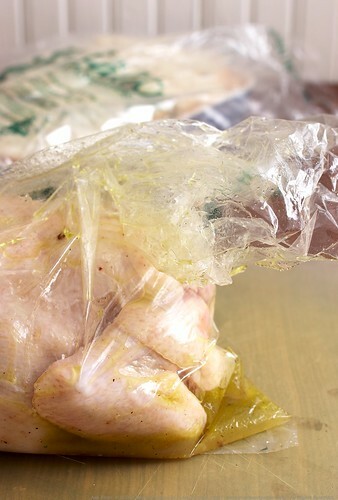 Seal the bag and place in the refrigerator for 4 to 6 hours. Remove the chicken from the bag and place in a deep roasting pan, breasts up, and tie the legs together with string. Tuck the wings in close to the body. 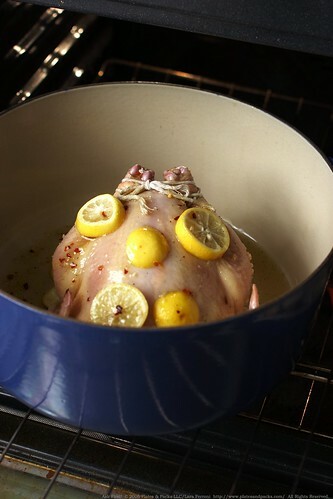 Pour the marinade over the top, then add the lemon slices to the pan, placing a few on the top of the bird. Roast for about an hour and a half, basting every 10 minutes or so. Remove the lemons after about 20 minutes. If the skin starts to brown too much, cover with foil. The chicken is done when in reaches 165F, and the juices run clear. Remove from oven and let rest for about 5 minutes before carving and serving. This entry was posted in Dinners, Food, Recipe, Savory. Bookmark the permalink. That is really gorgeous! I love roasted chickens and I’ve not done it with honey. About the split, I *believe*- don’t kill me if I’m wrong- the recipe I’d used requested that after 30 minutes of roasting at 500 (this was for a turkey), to cover the breast with tinfoil and lower the heat. I think the tin foil was to prevent the split happening (and the initial heat blast for color). Just a thought? Oh, but fyi, I didn’t notice the split until you mentioned it. It looks delicious. Yum, honey in a recipe like this is a real winner. 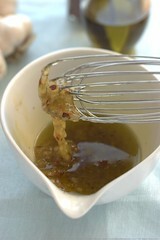 I love to use it in chicken marinade actually! And I am like you, a sucker for dark chicken meat! Oh it looks so pretty and juicy! YVO – Sounds like a good tip. I’ll try that next time! Pamela – Thank you! I think it’s just because I’ve had so many pieces of white meat that were cooked dry… the dark meat seems always to be tasty. Rasa – That’s true particularly with this recipe… the skin is where most of the flavor is! Chickens running around pecking at things aren’t so bad. We have a baker’s dozen! They’re dormant these days as the “girlie-girls” are in winter season. No, we DO NOT serve them on a platter, rather just gather their lovely organic eggs. I was intriqued by your choice of roasting pan. Do you use the lid on the dutch oven or simply use foil? BTW, what are the greens you’re using in your side salad? Miner’s lettuce? Those long stems are interesting. I’ve been told that consuming the local honey of the area one lives in is supposed to increase immune system to help fight off allergies. Thanks for sharing. I enjoy your writing and particularly the gorgeous photos! Wow I’m glad I found your blog (via shf #27). All the pictures look so scrumptious! 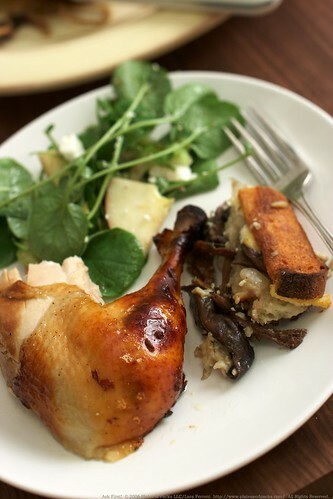 I love the honey roasted chicken, in fact I love everything I’ve seen on this site so far…. That sounds so yummy! Something about honey and chickens in a roasting situation works really well. I have a great standby recipe that involves smearing the chicken with butter and then coating that with honey. By the time it goes into the oven it looks like a giant pale toffee apple with wings 😉 It makes for an oh-so-succulent bird, and the tarragon, garlic, salt and pepper in the cavity infuse the meat with a wonderful flavour. 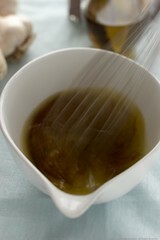 In your notes you recommend using buttery and citrusy flavored honey instead of Tupelo Honey. Can you give me names of buttery and citrusy flavored honey, I do not know too much about different flavors of Honey. Also you used a dutch oven instead of a roasting pan was that a better choice for the chicken becomes it comes with a lid. Thanks for posting this recipe. I’ve used it several times and absolutely adore it. I am curious what the side dish you have pictured is. It looks like some sort of mushroom/crostini creation, and it is making me hungry! 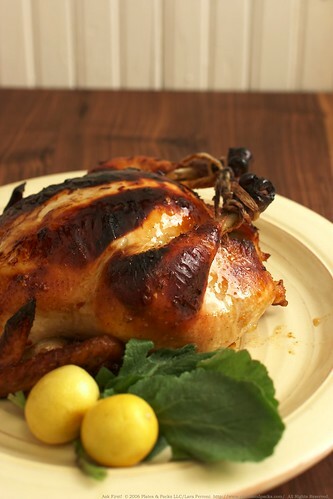 Roasting meat or poultry means oven-cooking it, uncovered, to produce a well-browned exterior and moist interior.